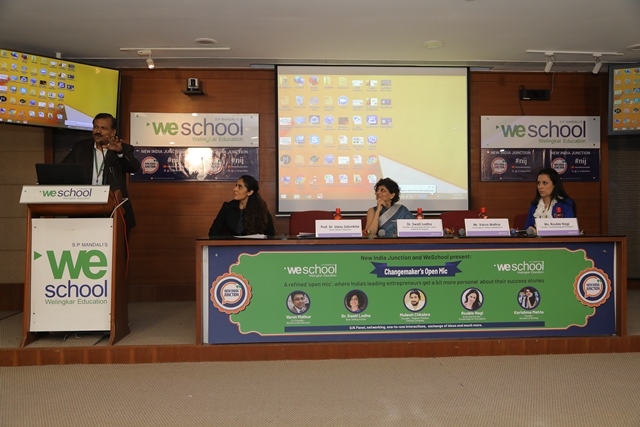 With an objective to inspire students to become changemakers in life, WeSchool and New India Junction, a youtube channel for the change-makers of today and the leaders of tomorrow, organised an open mic on WeSchool campus, Mumbai. The event can be well summed up in the words of Rouble Nagi, known for bringing Art to life through Misaal Mumbai. She mentions that while it’s important to earn money for a living, it is important to help the underprivileged. It is important to be a listener to friends, family or a poor person and step in as an initiator to make a change. Varun Mathur, Co-founder of Vertice Entertainment too inspired students to identify one change the students wish to make. It could be disruption in business or at a society level. He cited the examples of Tesla and how electric vehicles were once perceived as an impractical idea. However, the success of the idea made that idea as a changemaker. Hence, the hindsight of an initiator is simple and yet has the power to impact a million lives. Our third speaker, Dr. Swati Lodha shared her experiences as a homemaker, author and a parent of a teenager. She mentioned that it’s important for parents to raise themselves and not just focus on raising their children. On being asked if parent-child relationship can become irreparable, she said that while parents may not be aware initiating the change, the young children must take their first step to connect with parents and bridge the generation gap. In a nutshell, the session motivated the young talent to make a difference in the direction of a societal change.